"I was born in Montreal, Canada but moved to the deep south of Newport, Arkansas when I was one year old. Raised by Canadian parents deep in the Bible Belt in a town of 9,000 people, life has been an experience! I have moved many times since and I have had extended stays in Jonesboro, AR, Memphis, TN, Tempe, AZ, San Diego, CA and now I reside in beautiful Santa Fe, NM. My first BA was in history from Rhodes College, with a minor in International Relations. I have always enjoyed history and my artwork reflects this. My second, separate BA was from UAT in Tempe, Arizona where I graduated with a degree in multimedia design. Since then, I've combined my love of history, art, and travel into a career. I would best describe my artistic style as complex, modern, architectural, and detailed. I like to create artwork that can be revisited multiple times that will give the viewer something new to enjoy each time. I also believe that the flow of the eye is very important. The angles and flow of my work are very critical and I would consider it a dominant theme. I rarely include people in my work, preferring to focus on architecture, lines, and details. History is very central to my life. I like to contrast various moments of history and I particularly enjoy European history. My artwork must first be beautiful, but if possible, I like to add a layer of history upon it. My best and most famous works are undoubtedly my photo overlays. However, I do not consider myself a photographer, merely an artist. I enjoy a number of different mediums including watercolor, acrylic, sculpture, mixed media, etc. I am also learning lapidary (Gem Cutting) and jewelery making. Despite living in Santa Fe, New Mexico, I do not do typical southwestern art. I prefer the shadows of a modern building in Vienna over the cliché sunset on the mesa. Due to this, I travel worldwide to develop my artwork. So far, I've visited 26 countries and 3 continents, with many more to come! I'm always travelling and exploring. I try not to look at much modern art. I prefer to do my own thing and avoid outside influences. My favorite artists are from the 1920s Surrealist era. Miró, Dalí, Magritte, and Picasso are my favorites. I also enjoy the work of Alexander Calder. I really like his sense of color, versatility and his jewelry making inspired me to learn the craft as well. Finally, the one living artist that has truly inspired me is Gerhard Richter. His diverse abilities have driven me to explore different forms of art and I really enjoy his photo overpaintings as a precursor to more modern forms of photo overlay. When I'm not working on my artwork or travelling, I have a number of hobbies. I really enjoy hiking and the dangerous sport of downhill mountain biking. Both go well with collecting various rocks and gems I find on the trail to cut. I'm also an avid sports car / exotic car enthusiast and I love to go fast! In rare spare time, I also do some PC gaming with friends and I formerly owned my own train simulator software company so I am a computer nerd and proud of it. Most of my hobbies are quite dangerous, but I try to read 60+ books a year as well. Keep in mind when an artist dies their artwork triples in value! :D But I'm hoping to continue traveling the world, doing beautiful artwork and spreading positive energy to everyone!" 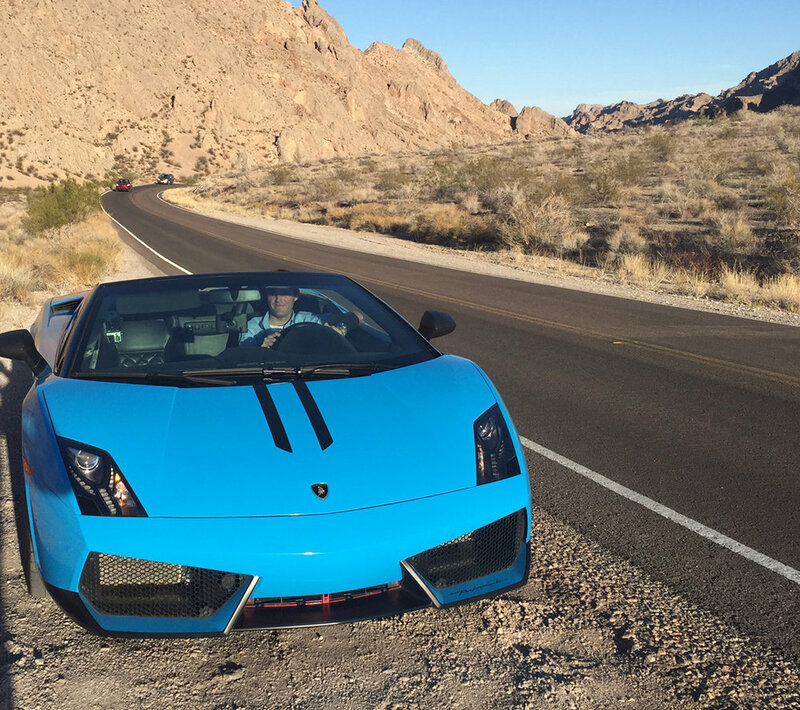 2014 Lamborghini Gallardo LP 570-4 Spyder Performante, aka "Turquoise." Tail of the Dragon, Eastern Tennesee. 11 Miles, 318 Curves, in the WRX STi 2004! Sooo fast! My C5 Vette that I had for 12+ Years! San Diego and Arizona Scenes.. Downhill Mountain Biking on my Specialized :) Full snow, Rio Grande Gorge, Santa Fe Forest. Injuries happen downhill... Often! :D I have a high tolerance for pain! It's not a good downhill season unless your sheets are covered in blood!